Yuki Kaji (eh…) and Saori Hayami (yay!) 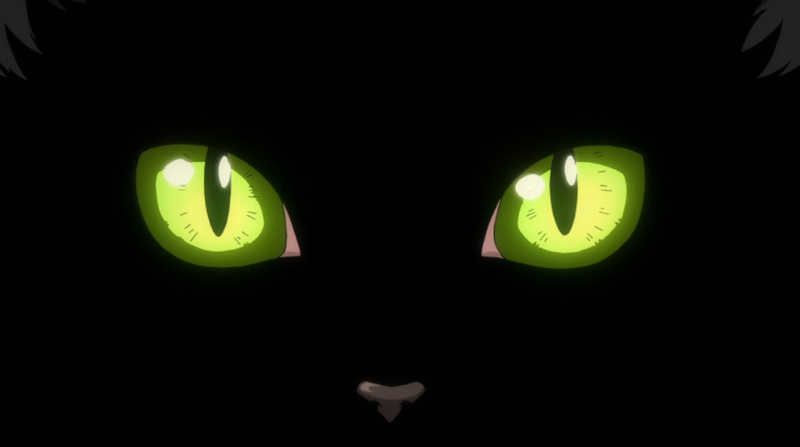 take the stage this week—as does stage fright for everyone involved in the Maihou Music Competition and one intensely green-eyed cat. 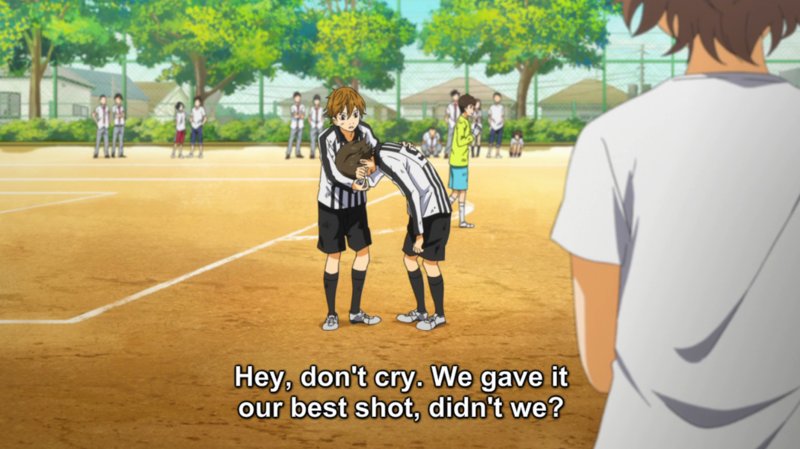 The other neat thing about Watari’s emotional breakdown in the toilet stall is that it parallels nicely with the struggles Kousei has caused his invisible (to him) rivals: Takeshi and Emi. 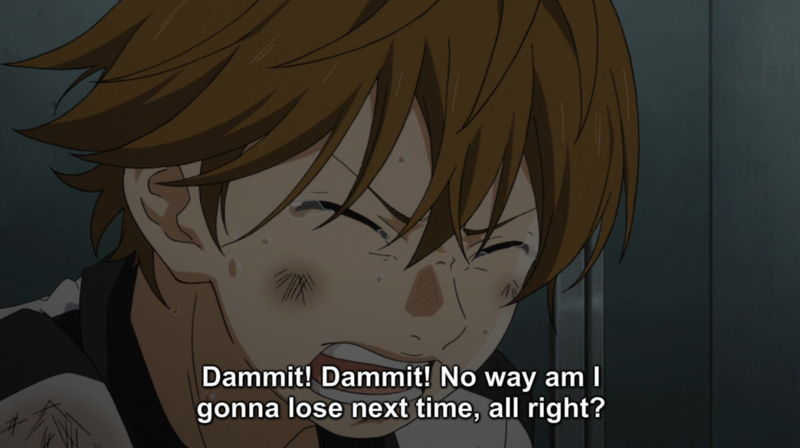 Watari’s agonized, “I won’t lose next time” is echoed in Takeshi’s feelings about competing against Kousei. 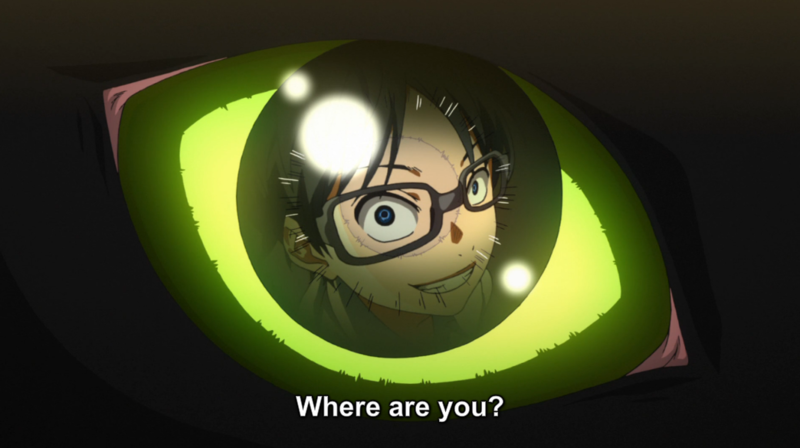 I also think it looks like a reimagining of Kousei’s battle this week of “Where am I?” To win, for these kids, is to put themselves on the map, to be seen, to be recognized, to shine. 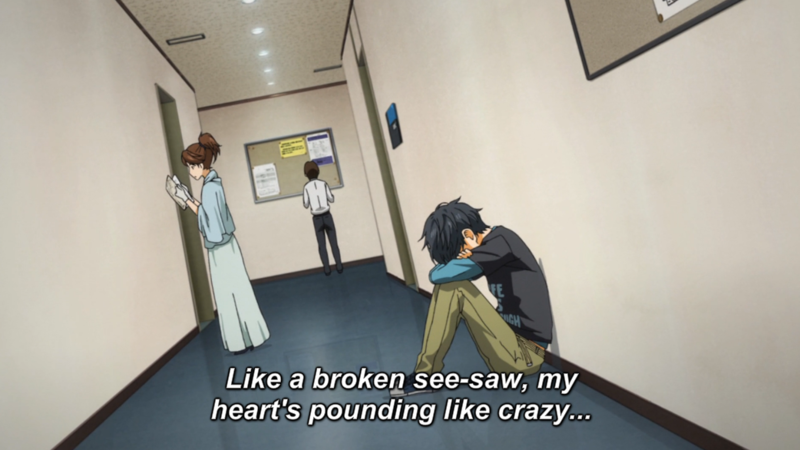 But Kousei, who’s done all that, has lost himself in the process. So where do you go from there? 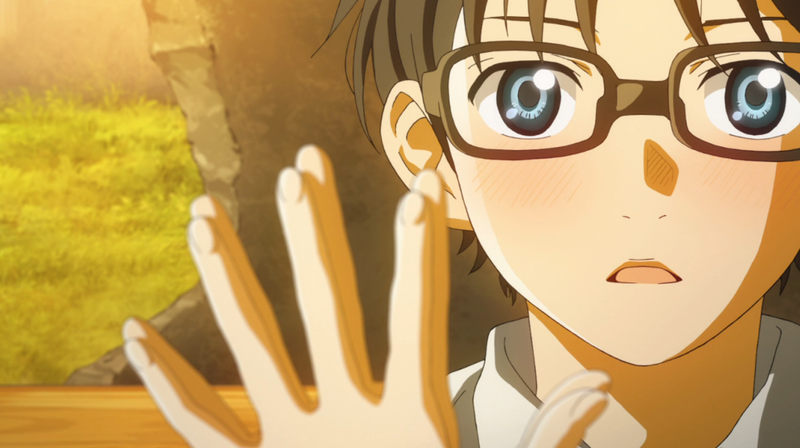 Kousei’s physical reaction to seeing the cat on the street kind of came out of nowhere for me and I’m not exactly sure what we’ve supposed to do with that bit of information. The causation is fairly clear to me—he didn’t speak up for this cat, Chelsea, like he wanted to when his mom took her away, and he regrets it—but to become, as it appears, nauseous over that memory seems to deviate from the normal symptoms of his trauma thus far. So, yeah. I’m not sure exactly why he had a physical reaction this time, when all his previous reactions to his memories have been routed through his brain and manifested in a sort of paralysis or panic. Whatever it was, the moment struck me as sort of clunky. All this, it seems, was really just to set up Kaori for the anime standby “You’re you” speech, which, while delivered in more eloquent terms than most, still just amounted to Kaori reminding Kousei that he’s not Chopin, just himself. 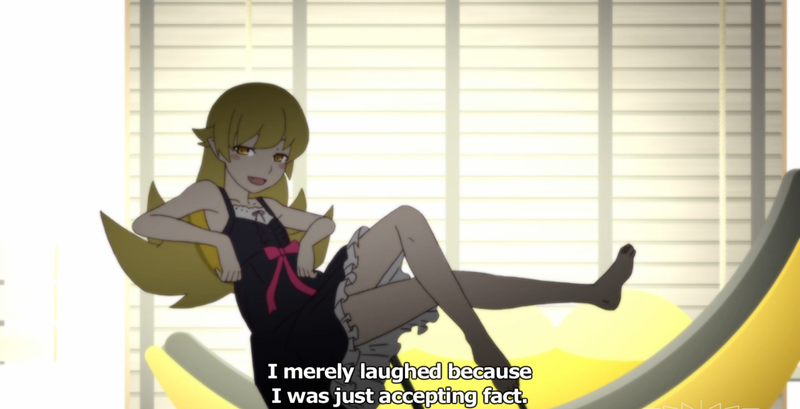 That, apparently, was the answer for Kousei, an answer he calls “laughably simple.” I’m not overly fond of characters talking about their solutions in this manner. Yes, I myself have often laughed when coming to an obvious realization, but for this line to come in a show like this, especially in relation to a worn-out trope, it just sounds like the show criticizing its own writing. Except, it seems that Kousei’s answer actually isn’t in finding himself as himself, but in believing in the power of music. The B part of the episode turns immediately away from all this to the competition itself, and starts with Kaori making an obscure reference to Köchel 265, which is Mozart’s variations on “Twinkle Twinkle Little Star.” Maybe this is just a piece of music competitions that I’m unfamiliar with, but it seems that contestants are assigned a song to accompany their entry number as some sort of program flavor text. 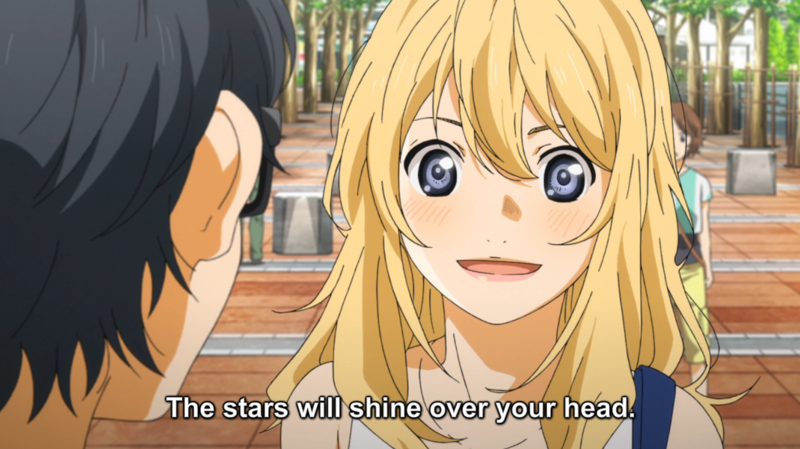 But Kaori begins this exchanging by saying, “Not good!” and concludes with “The stars will shine over your head,” at which Kousei laughs. If this is a musician in-joke, I didn’t get it. 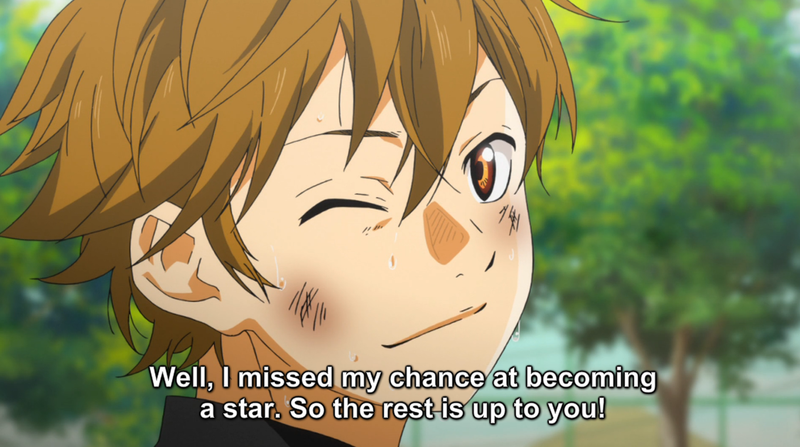 Best I can tell, Kaori’s telling Kousei he won’t be a star, but will be overshadowed by others. Maybe. And maybe that was a relief for Kousei to hear? Anyways, I liked that we ended the episode tackling pre-performance nerves—and that Kousei is effectively feeling them for the first time. That’s progress for him! That’s feeling something he’s never felt before; that’s Kousei interacting with music in a way he never has before, starting to inhabit a different world than he’s been in for all his life. He’s turning from a marionette into a real human. 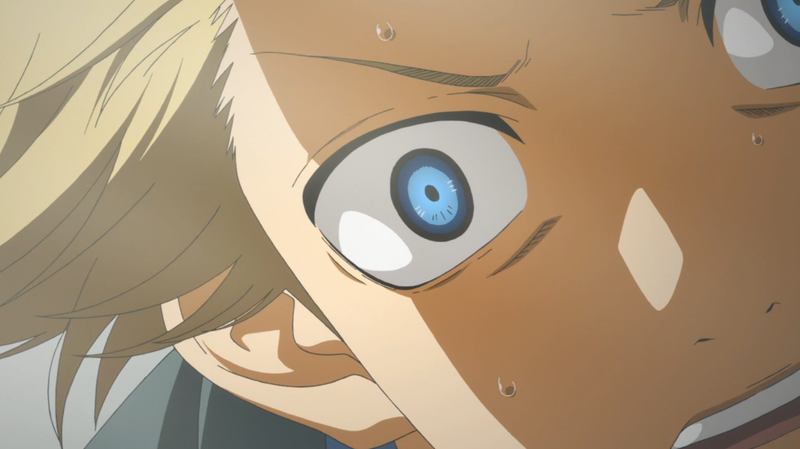 Meanwhile, Takeshi looks like he’s about to collapse from nerves (why do people always run the sink in anime when they’re stressed out? )—a scene that helps humanize him. There’s almost a sense of desperation in his desire to defeat Kousei, but the bathroom scene felt more like it was between him and the performance itself. I don’t really have a whole lot to say about the rest of the episode, which…isn’t great? Emi and Takeshi’s backstories are pretty much self-explanatory at this point, although I will say that I like Takeshi’s drive to overcome what has been a weight on his shoulders. For her part, Emi’s rage at Kousei seems less about being defeated and more about, as she sees it, Kousei’s violation of music itself. 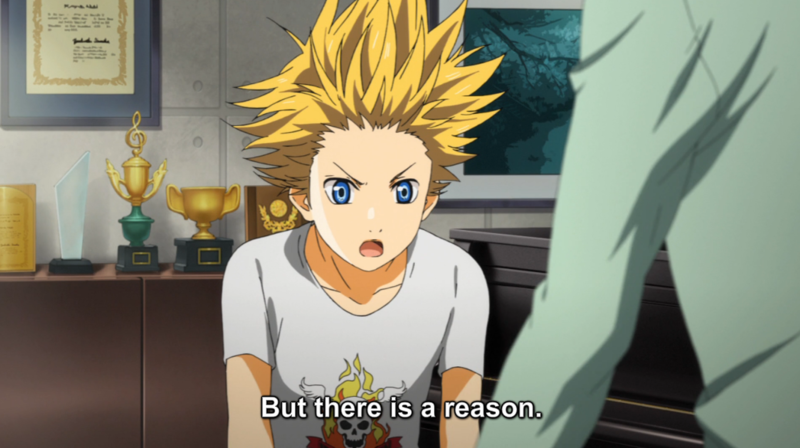 She calls his playing “boring,” reiterating Kaori’s explanation of Kousei’s infamy. 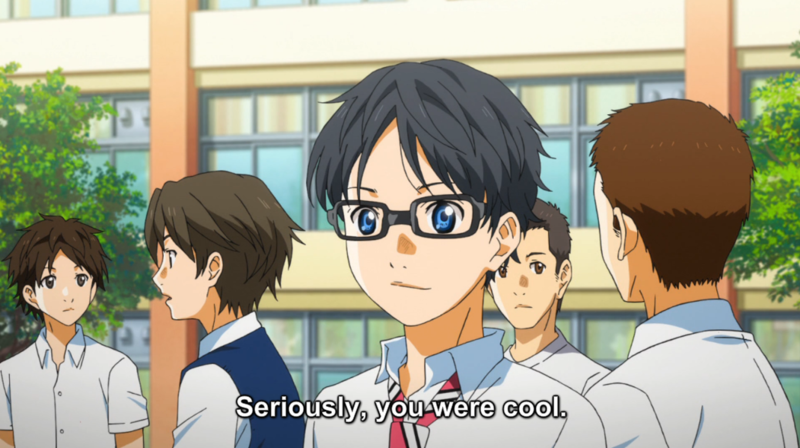 Oh, and Tsubaki and Watari raging at phantom detractors on Kousei’s behalf was pretty cute, too. 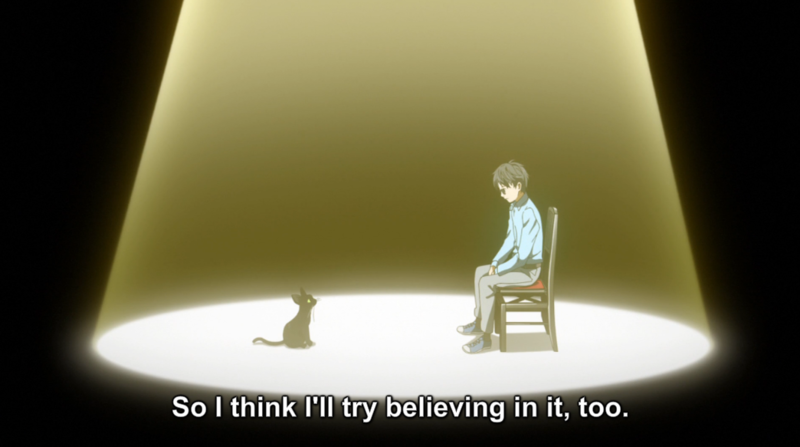 Overall, there were some gaps in this part of the story that haven’t been there in past episodes—the cat, Kousei’s resolution, “Twinkle Twinkle.” The show is still working on me at a gut level, but writing posts like these keep me aware that it’s much farther away from perfect than I’d like it to be. 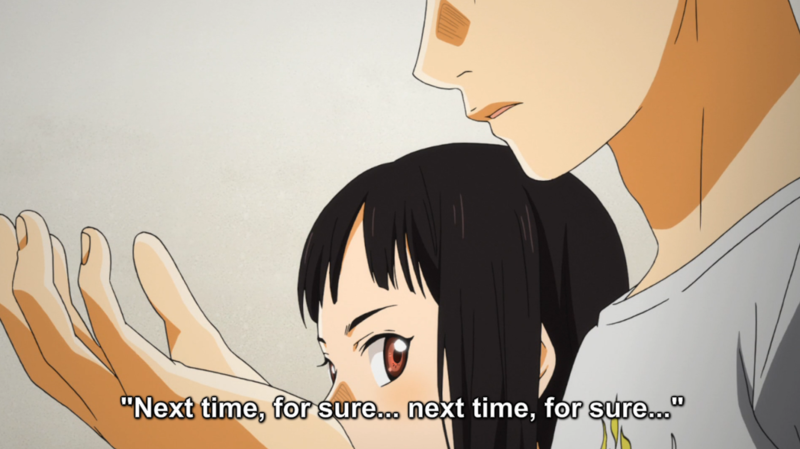 I’m not saying, really, that I want sweeping changes to be made, but more consistency would be nice—more Tsubaki and Watari would be great, too. 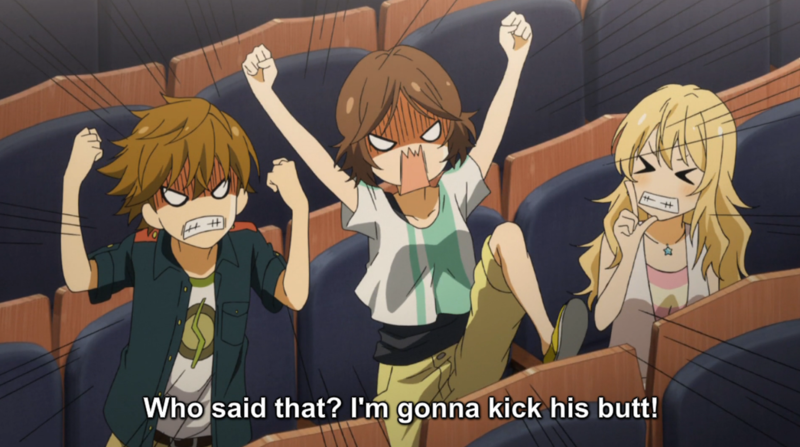 They’re easily my favorite characters in Your Lie in April to this point.